About 20 years ago, my husband and I were walking through a local department store around Thanksgiving time. I suddenly stopped dead in my tracks near an elaborate display of sparkling dishes which were precariously stacked with dinner plates, square salad plates, serving bowls, accent pieces, cups, mugs and saucers. "Oh, my gosh!" I gasped. "Those were my Mom's holiday dishes!" 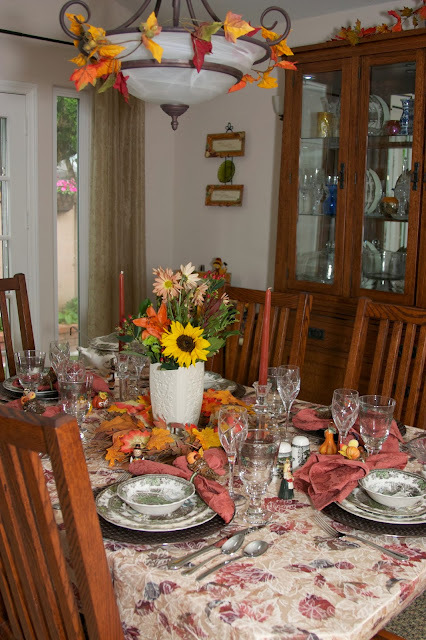 My Mom loved Early American furniture and the colors and country patterns of Johnson Bros.' Friendly Village fit in perfectly with her hutch that graced our small dining room. 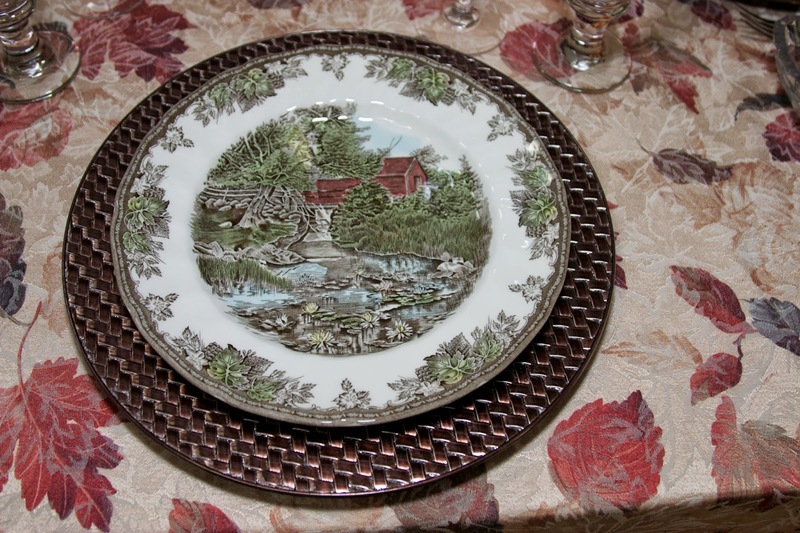 I didn't know that my adult years would be filled with a love of plates, flatware, glassware and accent pieces that would reflect a theme in the world of tablescaping, and that I'd actually KNOW a pattern name and the company that produced it! I started collecting various dishes in the Friendly Village pattern, and on this Thanksgiving, as well as the other Thanksgivings that have ensued since that holiday shopping trip so many years ago, the Johnson Bros. will be "joining us"on, not at, our Thanksgiving table, surrounded by my husband and me, four daughters, four sons-in-laws, seven grandchildren (and one on the way!) and my cousin. 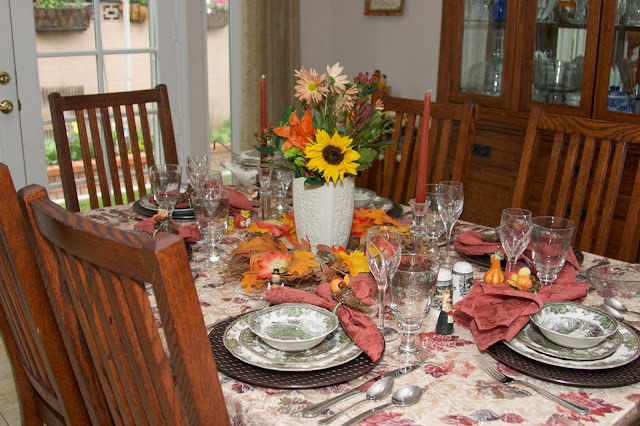 I can't help but think my Mom will also be there, smiling down at a tablescape so reminiscent of the ones we enjoyed at the Thanksgivings of my childhood! My dish stack begins with a dinner plate. 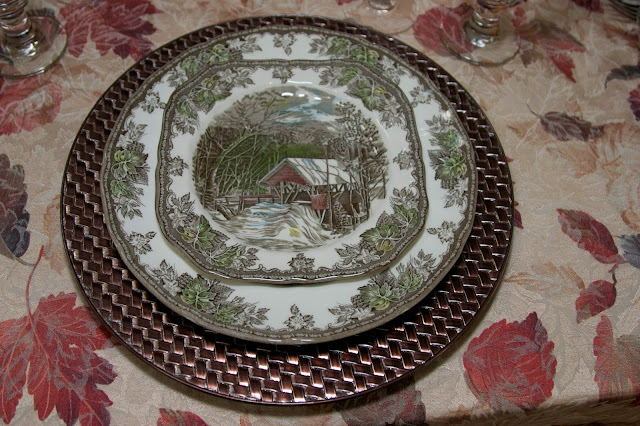 These Friendly Village plates have scenes of covered bridges (probably my favorite scene), farm yards, and other countryside pictures. Next comes the salad plate. 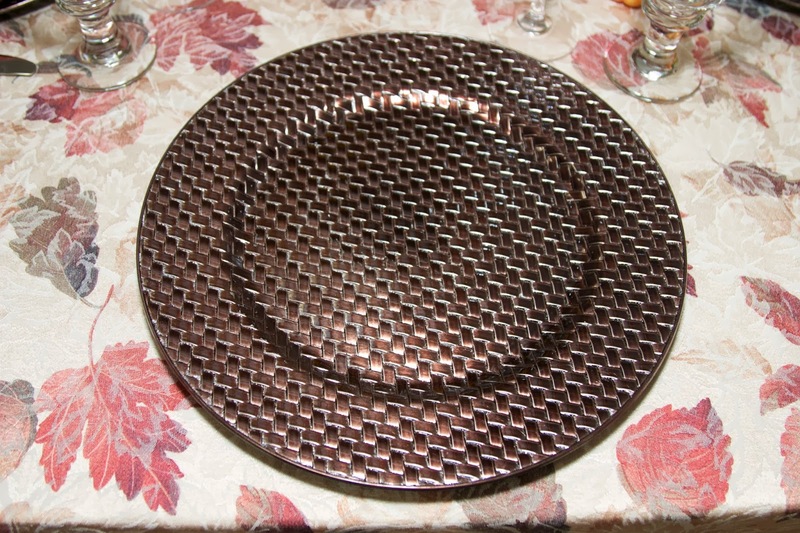 I have always loved these square-shaped plates. This pattern had square plates long before they became "fashionable" and were considered a contemporary look. The top layer of the stack is a bowl that is usually designated for cereal. However, I chose this instead of the regular soup bowl because I didn't want my guests to fill up on Butternut Squash Soup before the main event of Thanksgiving Dinner! I've surrounded the plates with napkins from Bed, Bath and Beyond, cornucopia napkin rings from a former department store which has since closed, Mikasa Olympus wine glasses and Johnson Bros. Friendly Village goblets. The flatware is Mikasa, Regent Bead. 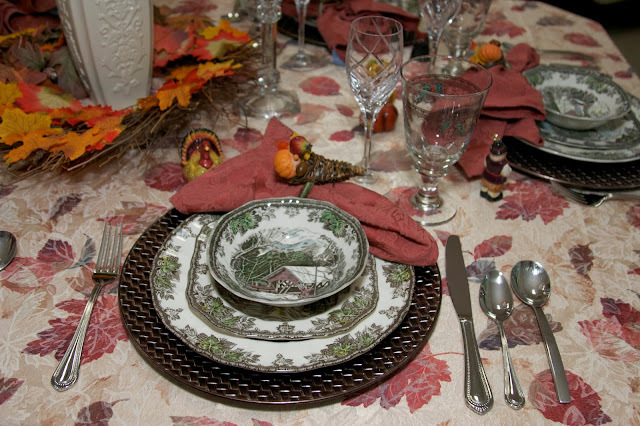 The placecard holders came from the Mikasa Outlet store: there are gourds, turkeys, and Pilgrims. I'd better get busy making a seating chart! 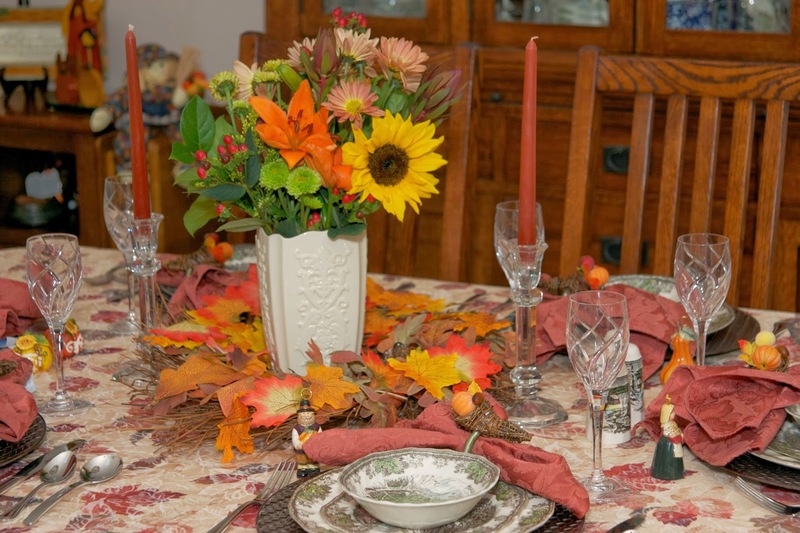 I kept the centerpiece simple because usually the food is the star of the show! I had some surgery recently, and my daughter brought over some flowers. The selection of blooms (their color and different textures) made it a no-brainer for a Thanksgiving tablescape! I placed them in a Lenox vase I've had for years, and added some crystal candlesticks which were wedding gifts to complete the picture. 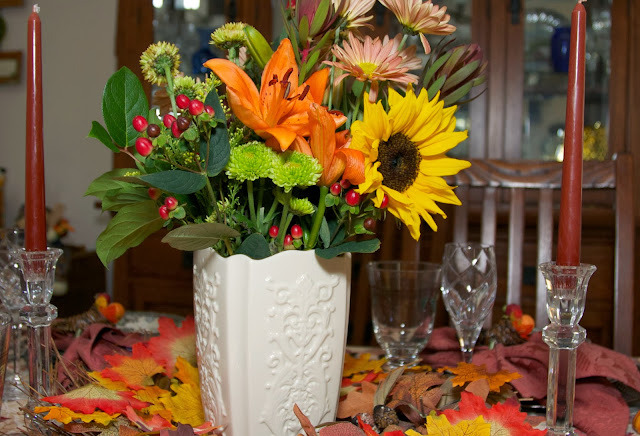 I used an extra wreath I had as a bed of leaves in which to nestle the flowers. 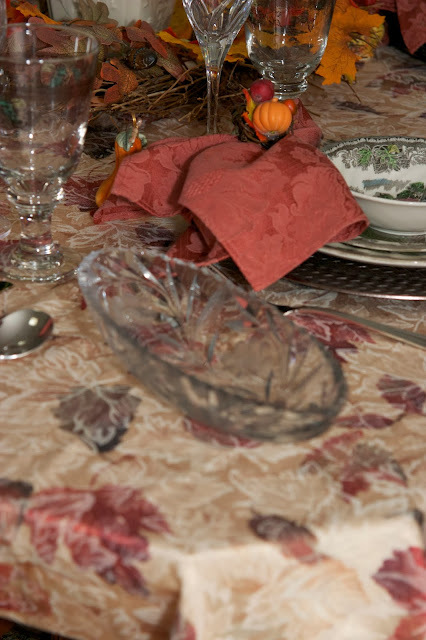 The table would not be complete without my Grandmother's cut glass serving dish which has been on every holiday dinner table for many years. 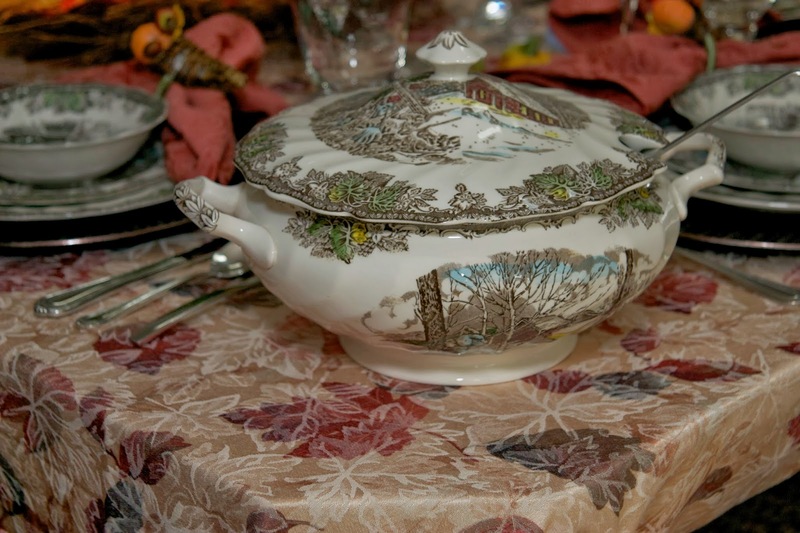 I also added my Johnson Bros. soup tureen. 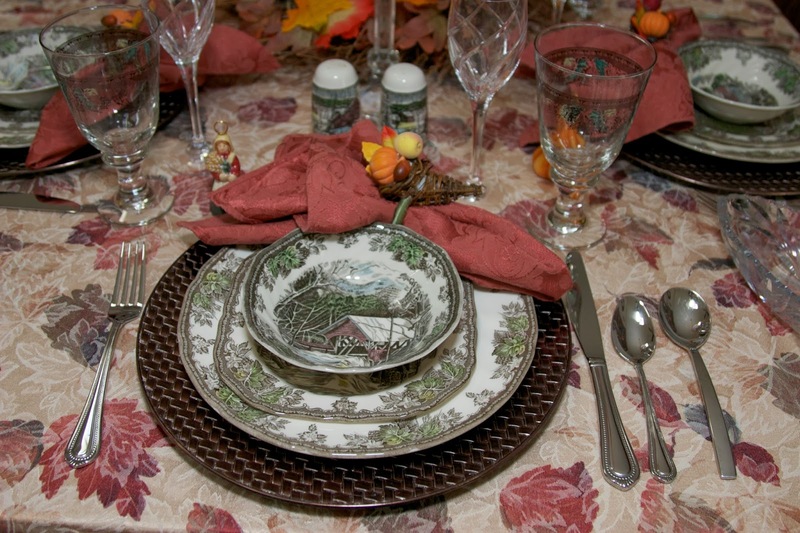 Here are some extra views of this table which wouldn't be the same without Johnson Bros. showing up!! Have a Happy Thanksgiving, Everyone!! Such a pretty table! I'm glad you have a set of Friendly Village, as it brings you so many wonderful memories! My daughter-in-law has a large set from her grandmother, and I am looking forward to seeing it on her Thanksgiving table this year. Thanks for dropping by! 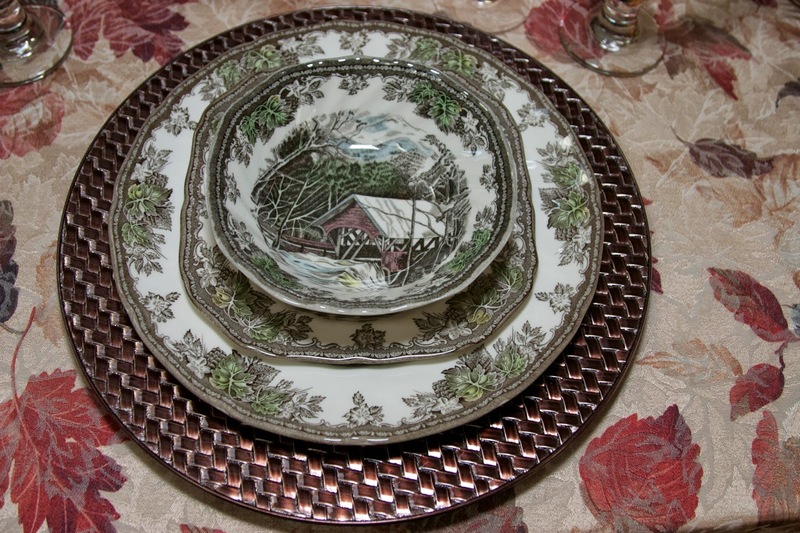 Since I've been looking at blogs, I've seen the Historic America pattern and have fallen in love with it! You should have a great time expanding that collection. Are all the plates in blue and white? Sooo pretty!! Thanks, again, for taking the time to comment. What a lovely table, Rosie. I love those dishes, so classic. Enjoy your Thanksgiving!~ Thank you for taking the time to comment!! I hope the Johnson Brothers enjoyed their dinner at your table. 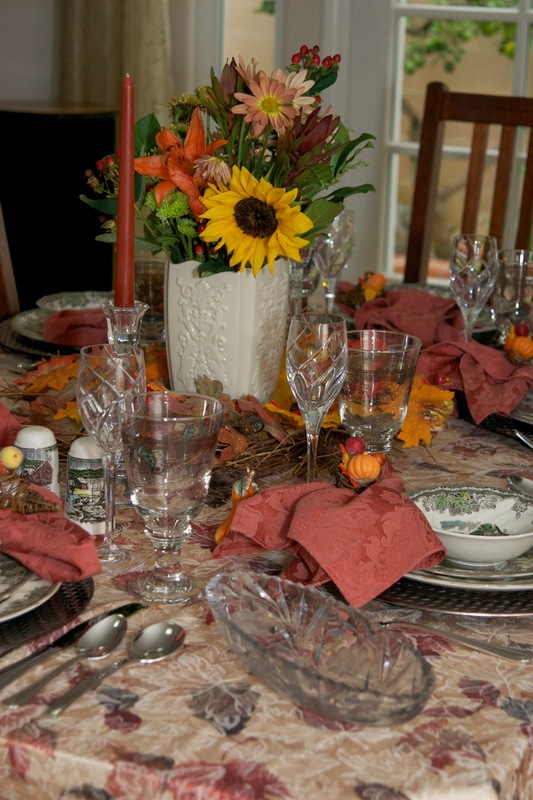 It is perfectly Fall and Tgiving, so pretty!